The Broke and the Bookish : Tahleen reviews: "mental_floss: The Book"
Have you ever wondered if Tang was really invented by NASA? How many pounds of bananas the average American eats in a year? Whether Harper Lee, F. Scott Fitzgerald or George Orwell almost named their seminal classics different titles? 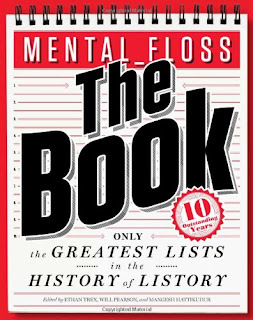 You will find all that out and WAY WAY more in mental_floss: The Book. This is the perfect book for trivia enthusiasts, coffee tables, and bathrooms alike. I haven't read through the whole thing yet, as there are many many lists within this pretty thick volume, but this is a book that I could pick up at any random moment in time and open up anywhere. I would enjoy it regardless. I personally enjoy trivia and little-known facts about celebrities, past presidents and politicians, and history. Who knew John Quincy Adams liked skinny dipping so much? Or that Lucille Ball was fired from her job at an ice cream parlor for forgetting bananas in a banana split? The lists are organized into subjects like "10 Food Lists That Will Make Your Mouth Water," "10 Lists to Read Before Naming Your Child, Company, or Alter-Ego," and "10 Lists to Lighten the Mood at the E.R." There really is something for everybody in here. You might be interested in every single list, but there is more than enough to compensate for the parts you find a bit boring. If you're stuck on last-minute presents or just need something to pass the time without getting completely caught up in a plot, this is your answer. And one more thing! 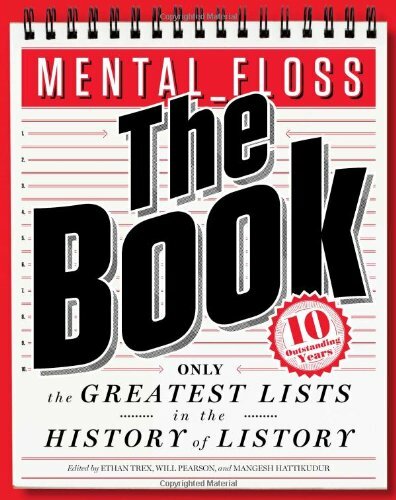 HarperCollins is going to give away a copy of mental_floss: The Book to one of you! Please fill out the form below by 11:59 p.m. EST on December 30 if you'd like a chance to win (sorry, I know, it's too late to get it for the holidays, but you'll probably want to keep it anyway). You must be a resident of the U.S. or Canada. Disclosure: The publisher sent me a copy of this book in exchange for an honest review. Love the concept of this book! However, I also love trivia and have a tendency to store useless information so I think I may be the intended audience for this book. It sounds like an awesome book! I love trivia and tiny but interesting details to bits. LOVE Mental Floss!! :D Magazines are fantastic!